This is a dedicated service designed for a full day travel. We have designed the service to suit a number of local tour purposes including sightseeing, attending meetings, shopping, seminars, visiting hospitals, and a lot more. If you don’t have enough time in hand to take a tour, reach us to enjoy a wonderful hassle free tour within the time period you can afford to allot. 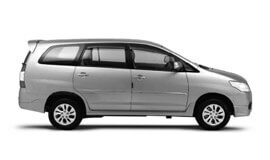 Some of the most popular services under this category include Airport Transfer in Pathankot, Car rental service for Marriage, party and event, Corporate Cab Rental in Pathankot, Railway Transfer, visiting hospitals and a lot more. For all kinds of outstation travel, rely on our special facilities provided under varied categories such as excursions, weekend getaways, and family leisure trip outside the city limits with our car rental outstation travel services. We believe in offering excellent quality to and fro. This is what we are known for. Our team will also take care of all your Pathankot visit needs. Our roundtrip service is available for various destinations from Pathankot. Our one way drop hire service will help you enjoy premium quality taxi service to your desired destinations starting from Pathankot. If you are looking for something special, reach our dedicated team of experts holding mastery in customizing packages for clients. They will take into account your specific car rental and tour needs and budget. We guarantee the best car rental services in Pathankot at highly affordable prices. Summer season in Pathankot starts from April and extends till July. June is the hottest month here. Winters in Pathankot start from November and carry on till March. January is the coldest month. Winter rains are seen during January and February. As per official census report for the year 2011, Pathankot district has a population of 159,909 residents. Pathankot is an economically affluent city as compared to various other towns of the state. Traditionally based on the timber trade, the main economy of the present time comes from stone crushing. Pathankot has also emerged as a commercial center of wholesalers and distributors of consumer goods and services. It caters mainly to Himachal Pradesh, J&K and northwest Punjab. Other contributions to revenue come from supply of crude oil, plastic storage tanks, cotton and mustard oil. Pathankot is a municipal corporation within Punjab and the capital of Pathankot district. The ideal location of district makes it a travel hub for all three north Indian states (Kashmir, Himanchal Pradesh, and Punjab). The beautiful city is widely known for picturesque tourist attractions. The most significant travel destinations of Pathankot include Mukteshwar Temple, Nurpur Fort, River Jabba, Nagni Temple, Kathgarh Temple, Shahpur Kandi Fort, Ranjit Sagar Dam, Jwalaji, Hydraulic Research Stations, Chintpurni, Sri Chinmayya Temple, and many more.